March 2011 Archives - Newman Dignan & Sheerar, Inc. - Providence Fee-Based Financial Advisors March 2011 Archives - Newman Dignan & Sheerar, Inc.
Earnings and economic news should remain fairly positive. The week ahead includes US consumer spending, disposable income and pending home sales being reported on Monday. We expect reasonable consumer spending numbers (increase @ 0.7%) along with moderate disposable income (increase @ 0.3%). Housing remains a wildcard as weather hampered sales in many parts of the country. Friday brings the US labor market report along with the ISM manufacturing report … these reports will likely set the market tone until earnings in a few weeks. Both numbers could be a tad weak following February’s lack of employment growth. It is an unusual time for sports fans when world affairs are more spellbinding than NCAA basketball. The past few days have found us more concerned with Libya and Qaddafi and Japan and their nuclear reactor dangers. However with Monday’s arrival we now see increasing hope that radiation may be contained in the reactors and that a limited involvement via the no-fly zone can be effective in protecting rebel strongholds in Libya. A protracted ground war involving U.S. troops seems most unlikely. With more time we can refocus our thoughts on the U.S. economy. Unemployment data has been improving slowly and in general the consumer seems a bit more confident. This Friday we will see the Michigan consumer confidence report. In general the manufacturing side of the economy has provided a lift and we continue to favor a number of equities in that sector. Economic and stock market news understandably took a back seat at the end of last week [which saw a 1.0% decline in the DJIA] to the Japanese earthquake and subsequent tsunami. The probable death toll has reached 10,000 and is still climbing. Our prayers go out to all who are affected by this tragedy. Conflict in the Middle East continued, with the Saudi Arabian “day of rage” fizzling and Libyan government forces gaining ground [in spite of US government cheer-leading for the insurgents]. These conflicts will regain the headlines [for better or worse] when Japan headlines fade. Last week’s retail sales figures confirmed the current economic expansion, and documented that January’s snowstorms were less disruptive than originally feared. Despite the volatility last week, the DJIA advanced 0.33% for the week. The big news items last week were the jobs report and oil prices. 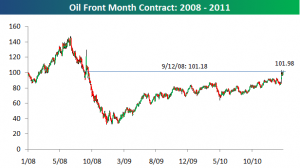 Crude oil ended the week at $104.41 per barrel, the highest since September of 2008. The jobs report was much improved over the prior two months with a reported 192,000 new jobs for the month and the unemployment rate declining to 8.9%. The economy will need to continue to create jobs at that rate in order for the unemployment rate to fall further. This week look for positive retail and auto sales numbers on Friday along with the University of Michigan consumer index. Look for continued volatility in oil as fighting in Libya causes further concerns about oil supply.